Funny how sometimes the things a person most fiercely resists later become the very things they embrace most completely. That’s certainly the case with Jason Mitchell, a dynamic young country singer whose music business childhood left him convinced he wanted nothing to do with being a performer. Jason moved to Ohio in grade school and developed interest in soccer, martial arts and just about anything besides making music. “I loved music, but I wanted to listen to it, and that’s it,” he says. Two events in a two-year period changed his course forever. Performing six shows a day and as many as 1,300 in one season, Jason poured himself into music. “I only knew two songs at first: 'My Girl’ and 'I Miss My Friend.’” He learned quickly, however, and soon produced his own CD, selling 1,000 copies in a just a few months. And a strong work ethic, the one he’d seen in his father, took over. 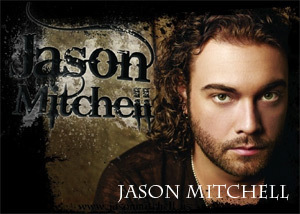 Jason began performing anywhere that would have him, working on his music and developing as an artist to the point he was signed by legendary Nashville manager Dale Morris. And he’s giving back, as promised. A foundation he started has already raised $25,000 for the Vanderbilt University Medical Center Burn Center. His debut single, “I’m Your Chicken Man,” shows Jason’s playful side, while songs like “Slow And Steady” smolder with passion. Going after fans one-by-one at each and every show, Jason Mitchell is as committed to his career as he once was opposed to the idea. And he’s a quick study. To book Jason Mitchell, please contact Lisa Darden at lisa@huptalentandbooking.com or call 240-446-1554.